Thousands of new businesses start up each year. 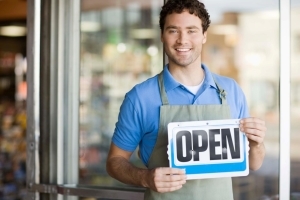 With customer loyalty to small independent retailers at an all-time high it’s a great time to start a new business. But even so, many more businesses continue to close down each year. The entrepreneurs that close their doors every year may have thought they were doing all the right things. The business plan was deemed perfect and the products or services were deemed innovative. So what was the problem? In many cases, poor cash flow is the answer. Cash flow is the air needed to sustain any business. When money is tight and the business can’t secure any loans, most businesses will be pushed to the brink of closure. So how can a small business owner maintain cash flow? It is vital for small business owners to analyse and thoughtfully estimate expected cash inflows and outflows. During the process, key factors to consider include industry delinquency rates, customer refunds/discounts and other terms, sales cycle and any other fact that can affect the timing of incoming cash. Expenses and other cash outlays should be considered as well. Factors to be considered here include daily expenses, taxes and schedule for salary payment. Here is a free template that addresses budgeting for small business owners. Having a budget is one step, but business owners need to compare the actual cash flow at the end of a month against the budget to see disparities. This will make it easier to address any possible cash flow loopholes. Monitoring can be done more frequently if needed, instead of waiting to do it monthly. Unexpected events can happen at any time, throwing the best cash-management setups under the bus. In such a situation, only businesses with a proper backup source of funds can keep functioning until normalcy returns. The contingency plans could involve friends and family, personal assets, business credit cards, personal loans etc. Regardless of what the backup plan is, it should be accessible in short notice and it should preferably be in place long before there is need to access the cash. Relying on a bank to underwrite and approve a loan in time to cover cash flow urgency is risky. The fastest banks will need weeks to complete the process, at which point the business may have failed already. Many businesses allow customers as much as 30 days to complete payment. This is risky for small business owners. While the customers take their time to complete payment, the business must continue to meet financial obligations. Business owners therefore need to find a way to make customers pay earlier. A good tip is to offer discounts to customers that pay off their bills within a week.